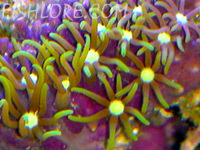 The Green Star Polyp is a good coral to start with if you're a beginner to keeping a reef tank. Green Star Polyps sport small star-like green polyps and encrust the substrate (live rock, walls) as their purple mat increases in size. They have several common names including Starburst Polyps, Daisy Polyps and the more common Green Star Polyps. These star polyps will do well when given moderate to high lighting and moderate to high and turbulent water flows. Keep your water parameters within standard reef tank requirements (see below for more details) and you'll be able to make your own GSP frags in no time. They are quite popular but still command a decent price for a frag, anywhere from $30 to $60 depending on the size of the frag. Your local reef shop should at least allow you to trade your frags in for store credit if they aren't overrun with them already since they are rather good sellers. To frag them get a new and clean razor blade and carefully slice them off the rock they are growing on. Then rubber band the newly sliced GSP on a frag plug. After it has encrusted the frag plug you can safely remove the rubber band, usually after a few days. Placement wise, keep them away from other corals since they don't have any offensive weapons other than claiming territory by encrusting it. Other corals with stinging nematocysts will sting them causing them to remain retracted and slowing their growth rates. That also causes both corals to lose in a situation like that since they are expending energy on defensive purposes rather than growth. Give your corals plenty of room to grow! Scientific Name : Briareium sp. Care Level : Easy to moderate. Moderate to high turbulent flows and moderate to high aquarium lighting is needed to get good growth rates. Along with standard reef tank water parameters, calcium, alkalinity, sg, and pH. How to Frag : Use a razor blade and carefully slice a piece of the purple mat and then rubberband it to a frag plug or rock. Remove the rubberband once the mat has attached to the frag plug or live rock. Coral Food : Not really needed. They should get most of what they need via photosynthesis. Symbiotic zooxanthellae provide most of their energy requirements. You can try feeding tiny foods like phyto but don't pollute your tank. Light : Moderate to high light levels are needed for good growth rates. They do well under T5's and metal halides. Water Movement : Moderate to high turbulent water flows are needed. Avoid blasting them with power heads or they may stay retracted. These green star polyps grow like a weed, encrusting the live rock very quickly. They are really pretty though and I like how they are spreading. 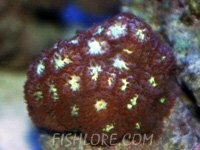 The Blastomussa coral is considered a good starter coral for new reef tank keepers given that it is relatively an undemanding coral. 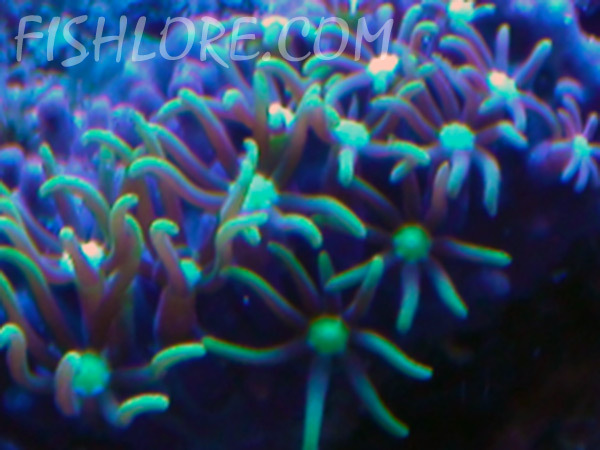 In general, low to moderate and mixed directional water flow along with moderate lighting will be fine for this coral. The Brain coral is one of the most highly sought after corals. Slow growers that need to be place well away from other corals. There are a few different color variations including brown, green and cream colors, usually with alternating white stripes. It fluoresces magnificently under blue moon lights.